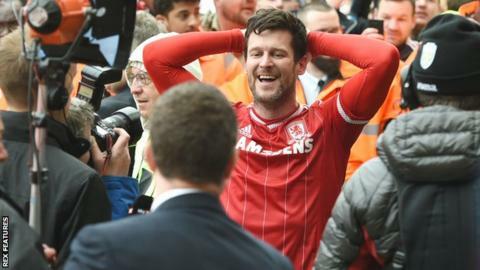 Derby County have signed striker David Nugent from Middlesbrough for a fee understood to be £2.5m. The 31-year-old former Leicester and England forward has signed a two-and-a-half-year deal with the Rams. "He's a proven goalscorer at Championship level and has a great deal of experience to bring to the table," Derby manager Steve McClaren said. Nugent, who began his career with Bury in 2003 before joining Preston, won his sole international cap in 2007. He came on as a substitute against Andorra in a Euro 2008 qualifier, during McClaren's spell in charge of the national team, and scored a goal in a 3-0 victory. The Rams tried to sign Nugent 10 years ago but he opted instead for a £6m move to Portsmouth. After four years with Leicester, he joined Middlesbrough in August 2015 and has since made 42 league appearances, scoring eight goals.